When I first departed onto my Colombian adventure, I had very little knowledge of the country, let alone its culture, its beautiful landscapes, its music (“vallenato” and “cumbia”) and most importantly its rich gastronomy. Colombian food is quite distinct from its South American neighbors and has many of its own typical delicacies. “El almuerzo” typically starts with a scrumptious soup; usually a simple broth made of garlic, onion, coriander, chopped vegetables such as potatoes and carrots and small noodles. Then comes the generous main dish that consists of meat such as chicken or beef accompanied by beans, potatoes, plantain and a small vegetable salad. This soup is the most typical dish from Colombia’s capital, Bogota. It contains pieces of chicken, large chunks of corn on the cob, different types of native potatoes (papas criollas, sabanera and pastusa), and guasca which is a common herb that is used in many South American dishes. This soup is served with a plate of avocado, capers and cream that you can add to your soup before beginning to eat it. This was definitely one of my favorite meals. But watch out, it’s quite heavy! This is considered a full meal. 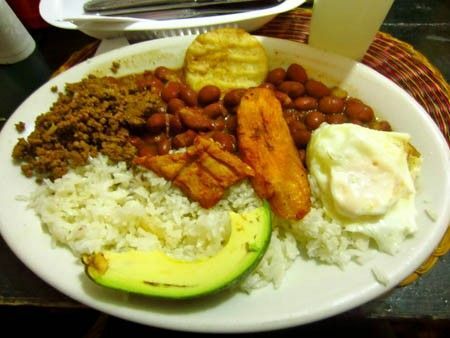 This large dish, typical from Colombia’s second largest city of Medellin, situated in the Paisa region, is a large mix of different foods and flavors and is served on a tray. The bandeja consists of thirteen main ingredients: red beans cooked with pork, white rice, ground meat, pork rind, fried eggs, plantain, sausage, arepa, hogao sauce, black pudding and avocado. This dish offers all of the delicious Colombian flavors in one platter. This all looks delicious!! I can’t wait to try it all, Emanuela what is your favorite out of these 3 delicacies? My favorite has to be the Ajiaco. A great way to make it even more delicious is to add avocado, cream and capers to the soup! Emanuela! Great article!! A very accurate description of the Colombian delicious food. I have always been amazed of the wide variety in Colombian dishes, across de different regions of the country. Keep on writing!! Hope to see new entries on the blog very soon. 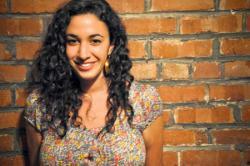 Emanuela thank you for this article about Colombia´s typical dishes. Ajiaco is also one of my favorites!! The North Coast food is also delicious!! you got to try Caramañolas and Arepa de huevo! Hello Emanuella great your article about our gastronomy, I’m from Cali Colombia and I can recommend the Sancocho Valluno and tamales wrapped in banana leaves are also very good, thank you for visiting our country I hope you come back to learn more about our culture.